As we get into the holidays, I'm all about speed and ease in which I make my meals. But, that doesn't mean that I have to sacrifice taste or the more wholesome options for myself or my family. 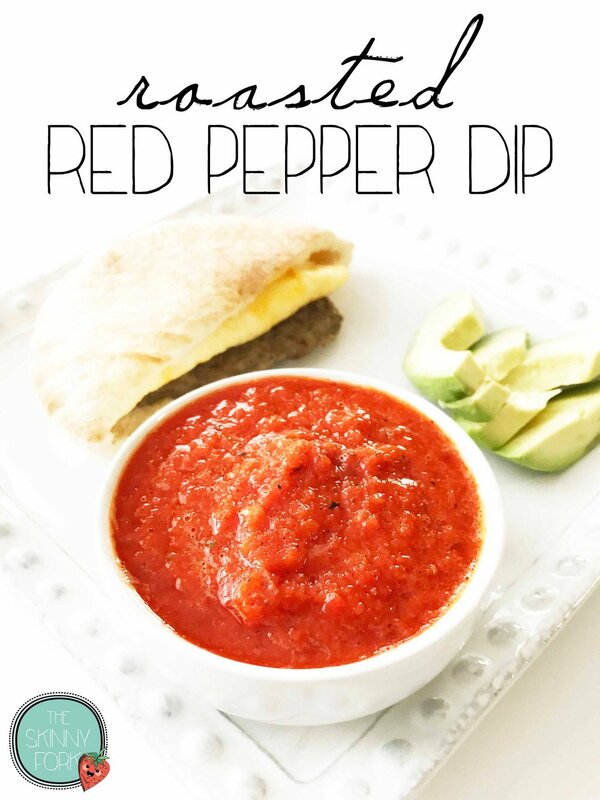 This roasted red pepper dip is super tasty, easy to make, guilt-free, and is so versatile that you could eat it with any meal; breakfast, lunch, or dinner! Plus, it's not spicy at all, so the kiddos can enjoy it too! This is definitely one of those things that you will find yourself putting on anything and everything. And, that's perfectly okay because that's what it's for! There's nothing but the good stuff loaded up into this red pepper dip. Roasted red peppers, onion, garlic, and plenty of course plenty of flavor. Today I decided to pair my roasted red pepper dip with breakfast. Not just any breakfast though, a perfectly delightful bite that took me no time at all to put together! A Sandwich Bros. 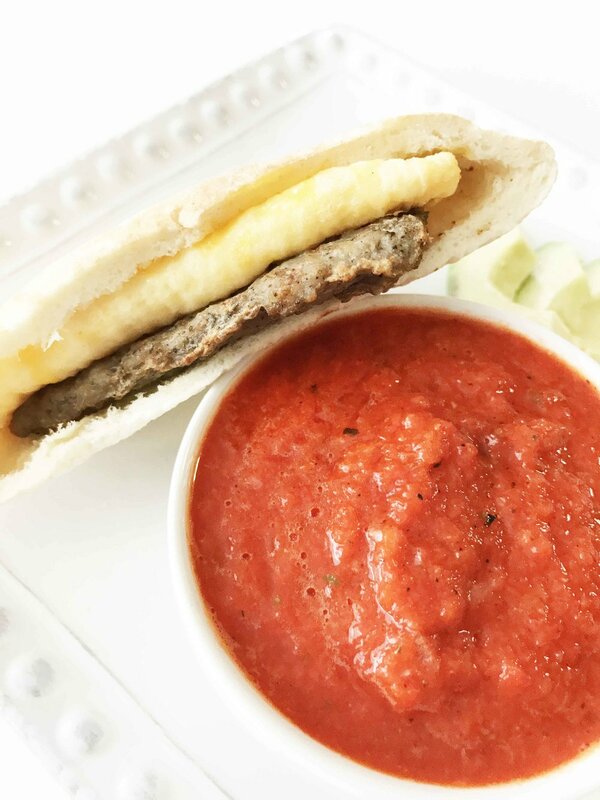 Egg White & Turkey Sausage Sandwich, paired with avocado, fresh fruit, and of course roasted red pepper dip! The Sandwich Bros. Egg White & Turkey Sausage Sandwich is “Really…Really Tasty!” and a great source of protein to energize and satisfy kids and adults! They have a great protein to carb ratio to energize the whole family. Plus, there are only 4 weight watchers points per sandwich, letting you eat healthier during the holiday season as it so quickly approaches. This is truly one of the best ways to start the day! But, it doesn't have to end there. This roasted red pepper dip would be great atop a salad, spread on a sandwich, or used as a dip for crackers in the form of a snack or appetizer. It would also make a pretty jammin' burger topping. Of course, be sure you try it out with one of these awesome Sandwich Bros. Egg White & Turkey Sausage Sandwiches for a perfectly amazing and quick breakfast! You can find a special print at home coupon available at SandwichBros.com! I picked up my box at my local HEB store. This recipe is super simple! Blink and you just might miss it. Toss everything into a blender, food processor or the cup of a hand-held immersion blender. Blend away to reach your desired dipable texture! Serve right away or store in an airtight container in the fridge for up to a week. Enjoy!